May 11, 1989. From river mile 46.9 near Collison downstream to river mile 29.8 at the Conrail Railroad crossing north of U.S. Highway 150. Scenic — 17.1 miles; Total — 17.1 miles. 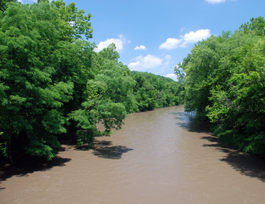 The river meanders deeply through Illinois' Grand Prairie glacial deposits, exposing scenic, steep, valley slopes with high bluffs of geological note. The valley's unique flora and fauna are highlighted in several adjacent natural areas and nature preserves, both forested and prairie, along with the river's recreational and historical characteristics. The majority of the designated river segment is publicly owned with a wide variety of access opportunities.